St Patrick’s Day Blog Hop!! Lots of Prizes!! CONTEST IS NOW CLOSED! WINNERS HAVE BEEN CONTACTED! THANK YOU FOR STOPPING BY MY BLOG. Grand Prize: Winner’s choice of a KINDLE FIRE or B&N NOOK TABLET!! Second Prize: Winner’s choice of $90 gift card to either Amazon or B&N!! HEAD BACK TO THE LIST AND BLOG HOP FOR MORE CHANCES TO WIN GREAT PRIZES!!! Now for your chance to win my prize — Winner’s choice of a $10 gift card from either Amazon or B&N. Here’s how you can enter to win THE $10 GIFT CARD. Each will earn you one chance at the prize! Enter one way or all ways. It’s up to you! 5. Add any or all of my books to your GOODREADS shelves! ** By leaving your comment in this contest, you’re agreeing to receive my “Only If I Have Big News!” newsletter, which may include information on new giveaways, contests, new releases, and newsletter subscriber only coupons. I promise to respect your inbox and will never send you spam. Need some fun reading this weekend? Run away to Paris with Tali and Gavin in LOVE ON LANDING. I love this holiday even though I can’t drink yet, I will be next month. My family celebrates the 17th and the 18 because my dads birthday is on the 18th. Your book looks gorgeous! Thanks for a chance to win. Good Morning Heather! I love St. Patrick’s Day. It is a national holiday in my family. Our preparations began yesterday. I took the day off work today to start my share of the food. We will begin bright and early tomorrow morning at 7:00 am to set up for the parade. From there it is food, food, food, and family time. We also put a pub crawl in there. Good time for all! I like it because it is cool to see so many people wear green. I don’t dislike the holiday, but since I don’t drink beer, it’s not as exciting as other holidays. Erin Go Bragh! I’m neutral on St. Patty’s Day…mostly because I don’t look good in green! I subscribed and liked your Facebook page. I don’t really get excited about it, do wear green and always cook corned beef and cabbage. My St Patrick’s Day tradition is to have a Shamrock Shake from McDonalds. I love those things. I have so many of them that I don’t want ANY more until the next St Paddy’s Day LOL! I don’t really have a St.Pattys day tradition (other then wearing green since I am part irish lol) but I plan on going out with friends tomorrow to a local pub for a party! I guess I like the holiday alright. I make sure I wear green that’s for damn sure lol. It’s a fun holiday. I love to see how “Irish” people can be. Thanks for coming along with the hop :)!! 1. Love it! an excuse to drink wayyy too much :)! 1. I love the parades! Thanks for participating in the hop! I like the holiday because i completely avoid it by staying at home most years and get some reading done. I married Irish, I have to celebrate, but I remember wearing green on St. Paddy’s Day so I guess I’ve always celebrated it. I try to make it fun around the house for the kids. I don’t celebrate because I’m not Irish lol but, all the green is cool! FB liked, and twitter followed (mebuffy). I love this holiday and the chance to wear green and pinch people! :-) Plus, luck is associated with this holiday and we all need a little of that, right?!?!? I can’t say that I love it, like it or hate it! I’m not Irish. Years back when I was still working, a couple of my co-workers and I would skip work for the afternoon and spend the day partying at Paddy McGee’s…the local Irish Pub. That was great fun! I like this holiday because I usually just have fun with it. I make a meal I enjoy, dress in green, and enjoy myself. St Patrick’s Day just does nothing for me. Just an excuse for people to act the fool. Already follow you on Twitter and your books are most definitely on my Goodreads TBR list! I like this holiday because so many people are out in green. It’s funny to see how “all out” people go for it. I subscribed and followed you! Like it. I don’t do much on St. Patrick’s Day. I pretty much wear green and then eat green food. That’s it. 1. I get your newsletter. 2. Love on Landing is on my TBR Goodreads list. no traditions but to wear green to keep from getting pinched. My husband is 50% Irish, but we won’t be doing anything. He has to work, so it’s me, my book and some me time. Darn! Not! lol! Oh and a soak in a hot tub. Happy St Patrick’s Day to me. Thanks for the giveaway. I will be putting you on my Goodreads and I joined your newsletter. Thanks for the giveaway! Happy St Pattys Day !! 1. I dont celebrate much, usually wear green to keep from getting pinched ! St. Patricks Day isn’t my favorite holiday but it is a time to get goofy with the green and the family comes together for corned beef and cabbage. I’m a Heinz 57 – my family didn’t follow any Irish traditions though, so I wear green unless I am in the mood for my hubby to pinch me *wink*, and I make corned beef and cabbage (YUM)!! I’m ambivalent about the whole holiday, but it’s an excuse to make cookies! I don’t particularly like or dislike this holiday. I’m know a huge fan of St. Patrick’s Day mainly because I don’t have any traditions and I ALWAYS forget to wear green! Thanks for the giveaway! Happy St. Patty’s Day! I’m all in favor of the beer. Especially Guinness. I’ve subscribed to your blog and added some of your books to my (waaaay too long) TBR list on GoodReads! I like it more for the kids and the break in the ususal routine. I like this holiday. To me, its fun. My family wear green and go to a parade. 🙂 Thanks for sharing and for the giveaway! Happy St. Patrick’s Day! Goodreads- Shadow Kohler, I added all three books to my to-be read list. I love this holiday for the legends and the food. 3. added Bunny Hills to my Goodreads. 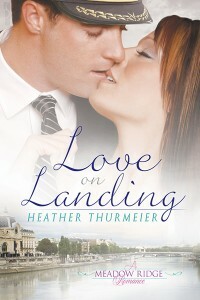 Love on Landing has such a pretty cover. We don’t formally celebrate St. Patrick’s Day but any chance to celebrate with friends and family is a wonderful thing. That’s who I’ll be with this weekend. I liked your FB page under Fiery Na. I am not a huge enthusiast and I do not have a deep Irish heritage though it does make up a significant percentage of my genes. I know how hard the Irish have fought to keep a separate ethnic heritage over the centuries (history buff, here) so I love the idea that we can celebrate this with them. I enjoyed the blurb on your new book. 1. Don’t feel either way about the holiday as we don’t really celebrate it. Thank you so much for the giveaway! I like St. Patty’s Day because it reminds me of my grandfather. We don’t have a lot of Irish in us (I am not sure exactly how much) but my grandfather was always proud of it, and collected the “Kiss me I’m Irish” merchandise. I love the holiday because of the availability of Shamrock Shakes!!! I don’t like or dislike St. Patrick’s Day we don’t celebrate it. I don’t celebrate anymore, but my kids like to, so grandma stays home and babysits. I don’t celebrate really for St. Pat’s Day. I may wear green but that is because it is my favorite color. Thanks for the giveaway. I follow you on FB – kay peters swederski. Even though we only do a few things to celebrate for this holiday I still like it because it’s just a genuinely fun holiday to celebrate I usually just hang out at home during this holiday but when I go out with my mom I like to sometimes see the decorations. It’s one of those holidays that you celebrate and have fun with whether you’re Irish or not. I’ve subscribed to your blog via e-mail: kakuchouakisame_19@yahoo.com and I’ve liked your facebook page! I’ve also put some of your books on my goodreads shelf! I like St.Patrick’s Day but I really don’t do much for it, maybe wear green and put up some decorations and that’s pretty much all. Thanks for the giveaway! This holiday doesn’t really impact me at all. I can’t believe you’ve never at least tried corned beef. If you like Shepherd’s pie you must eat red meat. I enjoy corned beef and the holiday gets me on sale so I’d say I like the holiday a little for that and it’s fairly low key where I live so thumbs up. I like it ok… I’m a bit biased because of the ‘reason’ but love the heritage. I love St. Patty’s Day, the beer, the music and all the green. I love the holiday in theory but I always forget about it! I don’t mind corned beef (especially with a pint of strongbow 😉 and I love Irish folktales. And I totally agree about the accent! Love the excerpt! My twin boys were born on st Patrick’s day, so I love it. Happy St. Patrick’s Day! I don’t celebrate this holiday, but I do find that people who do celebrate are very friendly. At least where I live, when they are having their fun, they always say hi and offer a drink. 😉 Thank you for the giveaway and HOP! It’s just another day to me. I love green!!! And Green Beer!! LOL!! I live this holiday because I can hang out with my friends and drink green beer. i love this holiday because i am irish and love the color green! I’m soooo drained from hopping that I think I’ll just sign here for the grand prize 🙂 Hope you’ve had a great day. Added your books on goodreads and signed up for newsletter. I still hate the holiday for all the memories of pinches in school! I never wore green, it was terrible! Although I do love corned beef and hash! I’m not Irish, but I love having a green beer with my friends! It’s an ok holiday. I really don’t celebrate it. Happy St Pat’s Day. Thanks for the giveaway. So this may be confusing because I’m logged in to multiple networks as different mes so you got whichever me that was. I followed you on Twitter as Lila Shaw and was already following you as Claire Gillian. I have I think 1 or 2 of your books on my to be read shelf at Goodreads as Claire Gillian. I like St. Patty’s day because I love green and like wearing that color. It goes with my auburn (Scottish) hair. Email address is in the login for the comment. Having Irish on both sides of my family I am a BIG fan of this holiday! LOVE the food and the family traditions! We don’t do anything on St. Patrick’s Day. I do try to remember to wear green! Thanks for the giveaway! Now I don’t celebrate it and I don’t drink alcohol but to everyone else have fun! I like this holiday since it seem like a fun holiday. I added Love and Lattes to Goodreads.